VISTA, CA—(Marketwired – Dec 31, 2014) – INTERNATIONAL LOTTERY & TOTALIZATOR SYSTEMS, INC. (“ILTS”) (OTC PINK: ITSI) announced today that effective as of December 30, 2014, International Lottery & Totalizator Systems, Inc., a California corporation (“ILTS California”), merged with and into its wholly owned subsidiary, Delaware International Lottery & Totalizator Systems, Inc., a Delaware corporation (“ILTS Delaware” or the “Company”). The purpose of the merger was to change the state of incorporation of ILTS California from California to Delaware. The merger was effected pursuant to that certain Agreement and Plan of Merger, dated January 8, 2014 (the “Merger Agreement”), which was approved and adopted by Berjaya Lottery Management (H.K.) Limited (“Berjaya”), the holder of 9,245,317 shares of the common stock of ILTS California, representing 71.3% of the outstanding shares, by written consent on January 9, 2014. A certificate of merger was filed with the Secretary of State of the State of Delaware and the Secretary of State of the State of California on December 30, 2014. Pursuant to the Merger Agreement, ILTS Delaware is the surviving corporation and changed its name to “International Lottery & Totalizator Systems, Inc.” Subsequent to the merger contemplated by the Merger Agreement, the Certificate of Incorporation and Bylaws of ILTS Delaware continued in full force and effect as the Certificate of Incorporation and Bylaws of the surviving corporation and the persons serving as the directors and officers of ILTS California became the directors and officers of the surviving corporation. On the effective date of the merger, the issued and outstanding shares of common stock, without par value, of ILTS California automatically converted into shares of the common stock, par value $0.01 per share, of ILTS Delaware on a one–for–one basis, and ILTS Delaware succeeded to all the assets, rights, powers, property, debts, liabilities and obligations of ILTS California. The shareholders of ILTS California were not required to surrender their certificates for the common stock of ILTS California, but may, at their option, surrender such certificates and receive certificates of ILTS Delaware common stock. The merger did not result in any change in the business, management, location of the principal executive offices, assets or liabilities of ILTS California. As a result of the merger, ILTS Delaware became the successor corporation to ILTS California under the Securities Exchange Act of 1934, as amended (the “Exchange Act”), with respect to its common stock and succeeded to ILTS California's reporting obligations thereunder. Pursuant to Rule 12g–3 promulgated under the Exchange Act, the common stock of ILTS Delaware is deemed to be registered under Section 12(g) of the Exchange Act. Effective as of December 31, 2014, at 5:00 p.m. Eastern Time, the Company amended its Certificate of Incorporation (the “Certificate of Amendment”) to effect a reverse stock split on outstanding shares of its common stock (the “Reverse Stock Split”) at a ratio of 9,245,317–for–1, whereby each 9,245,317 issued and outstanding shares of common stock prior to the Reverse Stock Split were automatically and without any action on the part of the respective holders thereof combined and converted into one (1) share of common stock. Berjaya will remain as the sole stockholder of the Company following the Reverse Stock Split and each stockholder holding less than one (1) whole share of common stock following the Reverse Stock Split will be paid $1.33 in cash per pre–Reverse Stock Split shares of common stock in lieu of fractional share interests. The Certificate of Amendment is intended to enable the Company to reduce its “record holders” (as defined by Rule 12g5–1 of the Exchange Act) below 300, thereby allowing it to file a Form 15 to cease its periodic reporting obligations under the Exchange Act and forego many of the expenses associated with operating as a public company subject to the reporting obligations of the Securities and Exchange Commission. Within ten (10) business days of today, Letters of Transmittal and other documents necessary for the exchange of stock certificates will be mailed to each stockholder holding less than one (1) whole share of common stock following the Reverse Stock Split, and they will include instructions for surrendering stock certificates in exchange for the cash consideration. As a result of the merger and reverse stock split, the Company will file a Form 15 with the Securities and Exchange Commission on January 2, 2015, thereby suspending and subsequently terminating its reporting obligations and status as a public company. In addition, the Company's common stock will cease trading on the Over–the–Counter Market after the close of business on December 31, 2014.
International Lottery & Totalizator Systems, Inc. provides computerized wagering systems, equipment and services to lottery and racing organizations worldwide. For more information, please visit http://www.ilts.com. This press release includes forward–looking statements within the meaning of the Private Securities Litigation Reform Act of 1995. This Act provides a “safe harbor” for forward–looking statements to encourage companies to provide prospective information about themselves so long as they identify these statements as forward looking and provide meaningful cautionary statements identifying important factors that could cause actual results to differ from the projected results. All statements other than statements of historical fact, including statements regarding industry prospects and future results of operations or financial position, made in this press release are forward–looking. We use words such as “anticipate,” “believe,” “expect,” “future,” “intend” and similar expressions to identify forward–looking statements. Forward–looking statements reflect management's current expectations, plans or projections and are inherently uncertain. Our actual results may differ significantly from management's expectations, plans or projections. Readers are cautioned not to place undue reliance on these forward–looking statements, which speak only as of the date hereof. We undertake no obligation to publicly release any revisions to these forward–looking statements that may be made to reflect events or circumstances after the date hereof or to reflect the occurrence of unanticipated events. Readers are urged, however, to review the factors set forth in reports that we file from time to time with the Securities and Exchange Commission. EAST AURORA, NY—(Marketwired – Dec 31, 2014) – Moog Inc. (NYSE: MOG.A) (NYSE: MOG.B) will broadcast the Annual Meeting of Shareholders on Wednesday, January 7, 2015 at 9:15 am ET, live over the Internet. John Scannell, Chairman and CEO, will host the meeting. Listeners can access the audio live over the Internet at http://www.moog.com/investors/communications. Please allow 15 minutes prior to the start of the meeting to download and install any necessary audio software. The audio will be archived on our website for 30 days. Moog Inc. is a worldwide designer, manufacturer, and integrator of precision control components and systems. Moog's high–performance systems control military and commercial aircraft, satellites and space vehicles, launch vehicles, missiles, automated industrial machinery, wind energy, marine and medical equipment. Additional information about the company can be found at www.moog.com. COLUMBIA, SC—(Marketwired – Dec 31, 2014) – A refreshing new look has taken over a prominent hotel in downtown Columbia, SC as new owners announce the recent completion of major renovations at the Courtyard Columbia Downtown at USC. Upgrading the hotel's interior, SREE Hotels, LLC has integrated the Courtyard's Refreshing Business Décor Package into the hotel lobby. Conveniently located in the heart of some of the city's most popular attractions, the lodging plays a vital role in the area's economic base. Making the acquisition in February, the hotel development and management company based in Charlotte, NC, now owns two Marriott–branded properties in the downtown district, the other being the SpringHill Suites Columbia Downtown/The Vista. The Courtyard hotel's location in Columbia is adjacent to the University of South Carolina and its bulging population of more than 31,000 students, just across the street from the Carolina Coliseum, and within walking distance of Williams–Brice Stadium for USC football and Colonial Life Arena, home of the university's men's and women's basketball events, concerts and other headline attractions. The hotel is also near the South Carolina State House and other government buildings and the popular Historic Vista District for vibrant shopping, galleries, museums, restaurants and nightlife. Featuring 5,000 square feet of meeting space, the newly remodeled Courtyard hotel offers locals and travelers access to the Capital Ballroom with a capacity of up to 400 people. Ideally located for business meetings, conferences, wedding receptions and other group events, the venue's amenities include professional catering for nearly any occasion and dedicated event managers to help ensure their success. A full–service business center along with meeting equipment and other business services that allow travelers to stay productive while traveling are also available. The Bistro, located in the hotel lobby, offers hearty and healthy dining options for breakfast and dinner, along with specialty beverages made with Starbucks coffee and a full offering of evening cocktails and favorite drinks. Other on–site amenities include an outdoor pool and well–equipped fitness center. Future plans call for the construction of a cover over the hotel's existing poolside patio to create a refreshing outdoor lounge area. The Courtyard Columbia Downtown at USC welcomes guests with well–appointed accommodations, a friendly atmosphere and intuitive service for a refreshing hotel experience. Inviting guests to think outside–the–room, the hotel's lobby offers plenty of space to roam with comfortable seating so guests can meet up with friends around the fireplace or cozy into a personal media pod with lots of plug–ins and a private television. Guests are pampered with free Wi–Fi throughout the property, and in–room amenities include large work areas, a 32–inch LCD TV, mini–refrigerator, coffee maker with tea service, crisp linens over pillow top mattresses and Paul Mitchell bath products. Whether traveling for business or leisure, the smart designs and exceptional service found at the Courtyard Columbia Downtown at USC, offers a comfortable change from the normal travel routine. COLUMBIA, SC—(Marketwired – Dec 31, 2014) – The Courtyard Columbia Downtown at USC is giving back to its community and lending a helping hand to guests with its participation in programs like Adopt–a–Street and Clean the World. 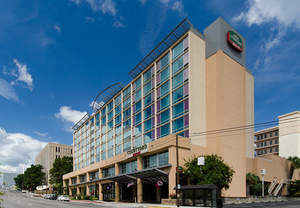 Its involvement with these and other programs, including helping guests during USC graduations and events, makes it one of the most popular hotel destinations in downtown Columbia, SC. Due to its location, near the University of South Carolina, the hotel has played a key role in many university events, and its sponsorship with USC makes it the “Premier Hotel Sponsor of USC Gamecocks Athletics.” Many visiting sports teams stay at the hotel due to this important sponsorship. In addition, hotel guests enjoy convenience for many USC functions, including move–in weekends, USC graduations, USC football games and teams celebrating victories. The hotel has also participated in a number of charity events to help better the community it's so actively involved in. The “Adopt– a– Street” program sees hotel staff cleaning the street up to four times a year, helping to keep the city clean, safe and inviting for visitors and locals alike. The hotel also participates in “Clean the World” — during which the property donates unused hotel soap, which is recycled and distributed to children in need all over the world. These programs are emblematic of Marriott's commitment to the communities that surround each of its properties, embodying the brand's “Spirit to Serve” efforts throughout the world. The unique location of the Courtyard Columbia Downtown at USC makes it an iconic hotel destination, poised to have a lasting impact on its surrounding community for many years to come. With a host of modern touches, it's become the go–to place for guests to rest their head while visiting USC. For more information on the program and what the Courtyard Columbia Downtown at USC is doing, visit the hotel website. The Courtyard Columbia/Downtown at USC is adjacent to the University of South Carolina, just a few steps away from Williams Brice Stadium, the Koger center and the Colonial Life Arena. The downtown hotel puts guests within a short distance of the State Capitol and the Historic Vista District, with its robust history, shopping and nightlife. After a day spent exploring or attending a University of South Carolina sporting event, travelers can return to the 189–room hotel, enjoying complimentary Wi–Fi, refrigerators in every room, a restaurant and the 24–hour Market. Guests are free to take advantage of its 24–hour business center, fitness center and laundry facilities. The hotel boasts 5,000 sq. ft. of meeting space. At the Courtyard Columbia/Downtown at USC, guests are always home. HOUSTON, TX—(Marketwired – Dec 31, 2014) – The New Year has always been a time for change, and the Houston Marriott North is no exception. This modern airport hotel has just begun a transformative remodel of its 15,000 square feet of event space, as well as of its fitness center and public bathrooms. And when the project is completed the changes promise to secure the property's position as one of the most desirable hotels near the Houston airport for meetings, conferences, weddings and events of every sort. The project's scope is immense. All 22 meeting rooms, including pre–function areas, will undergo a thorough renovation with everything from the ceiling tiles, to the wallpaper, to the carpet scheduled for replacement by January 24th. In addition to creating the most visually dynamic and functional meeting rooms in Houston, this renovation will also tackle the fitness center, which is due to be expanded and outfitted with state–of–the–art equipment, and the public bathrooms. The changes were inspired by guest feedback requesting new carpet and upgraded meeting spaces, and they are coming on the heels of other recent upgrades. The hotel recently painted the building's exterior and tinted all of the windows for better efficiency. These improvements not only distinguish the property from other hotels on North Houston's I–45 highway, they also speak to the staff's commitment to creating an exceptional guest experience. 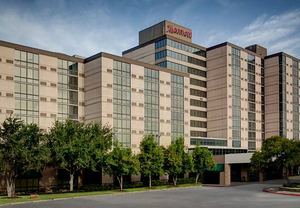 While the Houston Marriott North enhances its event space, which includes 18 breakout rooms, an 800–person ballroom and onsite exhibition space, guests will discover plenty more to appreciate about the property. Complimentary parking and airport shuttle service simplify travel, while guest rooms inspire relaxation with plush bedding, LCD televisions and upgraded Internet access. Plus the hotel is only minutes away from the airport and numerous businesses and attractions. Between its convenient location, contemporary accommodations and soon–to–be–renovated event spaces, the hotel promises to extend an even warmer welcome to guests arriving in Houston, Texas. From the moment visitors arrive at the Houston Marriott North, they experience a cool, contemporary welcome unlike any other. The new lobby sets the tone with flexible seating and easy access to the savory American fare of DEN, the hotel's stylish restaurant. The 390 guest rooms and suite feature signature Revive bedding, 37–inch LCD televisions and high–speed Internet access with even more amenities like free Wi–Fi and continental breakfast available in the expanded Concierge Lounge. In addition to the hotel's fitness center and indoor/outdoor pool, guests have plenty of opportunity for recreation with attractions like the Sam Houston Racetrack and Splashtown located just minutes away. And the hotel's close proximity to businesses like ExxonMobil, Hewlett–Packard and Exterran means it can extend its gracious welcome to corporate guests as easily as those arriving on vacation. SINGAPORE—1 January 2015, UNITED STATES—(Marketwired – Dec 31, 2014) – STATS ChipPAC Ltd. (“STATS ChipPAC” or the “Company”) (SGX–ST: STATSChP) (SGX: S24), a leading provider of advanced semiconductor packaging and test services, today announced its plan to relocate the Company's wholly–owned subsidiary, STATS ChipPAC Shanghai, Co., Ltd. (“SCC”) to a new manufacturing site in China. SCC is a 983,000 square foot packaging and test operation located at No. 188 Huaxugong Road, Xujing Town, Shanghai, People's Republic of China (PRC). Recent changes in the long term zoning, development and construction plans for the West Hongqiao area of China have resulted in the need to relocate SCC by the end of 2017. STATS ChipPAC will be working with the Qingpu Land Planning Bureau, the Qingpu District Land Reserve Center and the Shanghai Qingpu District Xujing Town House and Land Expropriation Compensation Office to transfer the land currently occupied by SCC to the relevant PRC local authorities and identifying a new location for the manufacturing operation. Established in 1994, SCC provides high volume, low cost turnkey solutions encompassing wafer bump, wafer probe, packaging, final test and distribution services. SCC offers a broad portfolio of leaded, laminate, stacked die, memory card and flip chip packages to support multiple customers in the communications, consumer and computing markets. Certain statements in this release are forward–looking statements that involve a number of risks and uncertainties that could cause actual results to differ materially from those described in this release. Factors that could cause actual results to differ include, but are not limited to, general business and economic conditions and the state of the semiconductor industry; prevailing market conditions; demand for end–use applications products such as communications equipment, consumer and multi–applications and personal computers; decisions by customers to discontinue outsourcing of test and packaging services; level of competition; our reliance on a small group of principal customers; our continued success in technological innovations; pricing pressures, including declines in average selling prices; intellectual property rights disputes and litigation; our ability to control operating expenses; our substantial level of indebtedness and access to credit markets; potential impairment charges; availability of financing; changes in our product mix; our capacity utilisation; delays in acquiring or installing new equipment; limitations imposed by our financing arrangements which may limit our ability to maintain and grow our business; returns from research and development investments; changes in customer order patterns; customer credit risks; disruption of our operations; shortages in supply of key components and disruption in supply chain; inability to consolidate our Malaysia operations into our China operations and uncertainty as to whether such plan will achieve the expected objectives and results; loss of key management or other personnel; defects or malfunctions in our testing equipment or packages; rescheduling or cancelling of customer orders; adverse tax and other financial consequences if the taxing authorities do not agree with our interpretation of the applicable tax laws; classification of our Company as a passive foreign investment company; our ability to develop and protect our intellectual property; changes in environmental laws and regulations; exchange rate fluctuations; regulatory approvals for further investments in our subsidiaries; majority ownership by Temasek Holdings (Private) Limited (“Temasek”) that may result in conflicting interests with Temasek and our affiliates; unsuccessful acquisitions and investments in other companies and businesses; labour union problems in South Korea; uncertainties of conducting business in China and changes in laws, currency policy and political instability in other countries in Asia; natural calamities and disasters, including outbreaks of epidemics and communicable diseases; the continued trading and listing of our ordinary shares on the Singapore Exchange Securities Trading Limited (“SGX–ST”). You should not unduly rely on such statements. We do not intend, and do not assume any obligation, to update any forward–looking statements to reflect subsequent events or circumstances. STATS ChipPAC Ltd. (SGX–ST Code: S24) is a leading service provider of semiconductor packaging design, assembly, test and distribution solutions in diverse end market applications including communications, digital consumer and computing. With global headquarters in Singapore, STATS ChipPAC has design, research and development, manufacturing or customer support offices throughout Asia, the United States and Europe. STATS ChipPAC is listed on the SGX–ST. Further information is available at www.statschippac.com. Information contained in this website does not constitute a part of this release. TA XBIEX, MALTA—(Marketwired – Dec 31, 2014) – The Jackpot Factory casinos are ringing in 2015 with a New Year's Bonus Party unlike any other. Players at All Slots, All Jackpots, Wild Jack, First Web and the VIP Lounge Casinos are invited to join weekly bonus parties for the chance to win a share of $55,000 in prizes, including generous bonuses, thrilling free spins, and sensational giveaways. From a rockin' 80s party to a glamourous Royal Ball, each week offers an exciting way to celebrate and win big. Two of the month's bonus parties feature exciting gift giveaways that will truly enhance the winners' music listening experience. At the 80s Bonus Party taking place January 6–10, the online casino group will give away Bose SoundTouch™ Wi–Fi® Music Systems, and at the Royal Bonus Ball running January 27–31, lucky players will win Bose QuietComfort® 25 Acoustic Noise Cancelling® headphones for better sound both at home and on the go. The New Year's Bonus Parties run between December 31 and January 31. Players will earn prize tickets towards the weekly draws by depositing and playing their favourite online casino games at any of the five group casinos. The more tickets a player earns, the better the chances of winning big. Established in 1999, the Jackpot Factory Group of Microgaming–powered casinos offers the largest and latest selection of games for PC and mobile devices. As an eCOGRA–approved operator, the group prides itself on its customer support, fast payouts and honest play. 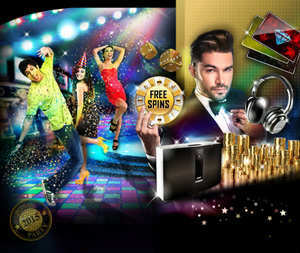 Members include: All Slots Casino, All Jackpots Casino, First Web Casino, Wild Jack Casino, and the VIP Lounge Casino. For further information, visit: www.jackpotfactory.com. The Jackpot Factory is dedicated to promoting responsible gaming by proactively preventing under–age play and assisting members who develop gambling problems. lynda.com is a leading online learning company that helps anyone learn business, technology and creative skills to achieve personal and professional goals. Through individual, corporate, academic and government subscriptions, members have access to the lynda.com video library of engaging, top–quality courses taught by recognized industry experts. The company also provides German, French and Spanish–language content under the video2brain brand name. lynda.com was founded in 1995 and is headquartered in Carpinteria, California with offices in San Francisco, London, Sydney and Graz and is funded in part by Accel Partners, Spectrum Equity and Meritech Capital Partners. Learn more about the lynda.com story at www.lynda.com/press and on Facebook at www.facebook.com/lynda. PHOENIX, AZ—(Marketwired – Dec 31, 2014) – ClearDATA today announced that 2014 was a banner year for the healthcare–exclusive provider of cloud computing, platform and information security services. Among the company's leading accomplishments, according to company executives, were key partnerships with major health IT companies, new products, awards and recognition. Frost & Sullivan recognized ClearDATA with the 2014 North American Healthcare Cloud Leadership Award. ClearDATA received this recognition for its broad product portfolio comprised of Infrastructure as a Service, Platform as a Service as well as professional and managed services. ClearDATA was also prominently profiled as an industry leader who will lead market growth in the next 3–5 years in Frost & Sullivan's report, “Opportunities in Healthcare Cloud Application in the US and Europe” (Oct. 2014). The company was designated as a major player in the North American Healthcare Cloud Computing Market in MarketsandMarkets' 2014 North America Healthcare Cloud Computing Market – Forecast to 2018 report. Access, a leading provider of enterprise e–forms management and technology solutions for the healthcare industry, selected ClearDATA's HealthDATA™ Cloud Computing Platform to host its suite of software solutions. Central Logic, the healthcare industry's leading provider of innovative patient flow software, selected ClearDATA's HIPAA–compliant HealthDATA™ Cloud Computing Platform and Security Services to host its software solutions. Central Logic provides its patient flow software and solutions to hundreds of hospital sites in the United States. HealthUnity, a leading health information technology company dedicated to secure, privacy–protected health information acquisition, integration, exchange and analysis, joined forces with ClearDATA to successfully complete the implementation of secure Direct Messaging capabilities with Consolidated Clinical Document Architecture (CCD–A) transfer for one of the largest hospital systems in the nation. Infor, a leading provider of business application software serving more than 70,000 customers, handpicked ClearDATA to host its new cloud–based Infor Cloverleaf Integration Suite of software solutions. Liaison Technologies, a global provider of secure cloud–based data management and integration services and solutions, will deliver its data services to customers in the healthcare industry on ClearData's HIPAA–compliant cloud platform. Merge Healthcare designated ClearDATA to be the cloud–computing provider for its Merge One software product, designed to connect ambulatory radiology sites to a cloud storage environment. Merge will offer secure application hosting to its customers on ClearData's HIPAA–compliant HealthData cloud platform. Launched the industry's first compliant, intelligent, encryption–based medical image storage solution to provide secure, cost–effective, HIPAA–compliant medical image data protection and storage for hospitals and healthcare organizations of all sizes and types. Released a new version of the ClearDATA SSL VPN that delivers industry leading cross–platform security for remotely accessing PHI and other critical applications. Introduced a new cloud–based Archive as a Service solution, the first offering of its kind created specifically to meet HIPAA requirements for archiving of healthcare data that does not need to be accessed immediately or regularly. Developed a healthcare–exclusive Desktops as a Service (DaaS), a cloud–hosted virtual desktop which includes awarePatientCare for capacity management. ClearDATA successfully achieved Common Security Framework (CSF) Certified status from the Health Information Trust Alliance (HITRUST). This independent, third–party certification assures healthcare organizations that ClearDATA's cloud computing, backup, disaster recovery and professional services meet the highest standards for managing security risks and protecting health information. HITRUST CSF is an information security framework that incorporates international, federal, state and third–party regulations and standards to establish an encompassing, first–class standard for security, privacy and compliance. Standards and regulations incorporated into the certification include HIPAA, HITECH, PCI–DSS, ISO 27001, COBIT, NIST and FTC. In October, ClearDATA opened a new office at 77 Geary St. in the heart of San Francisco's technology belt in Union Square. ClearDATA's San Francisco location will be key to expanding its software development teams focused on continuous improvements to its HealthDATA™ platform and the company's strategic technology roadmap efforts. ClearDATA is exclusive to healthcare and is the industry leader in cloud computing, platform and information security services. More than 300,000 healthcare practitioners rely on ClearDATA's secure, HIPAA–compliant, HITRUST CSF–certified cloud HealthDATA™ infrastructure and platform to store, manage, protect and share their patient health information and critical applications. For more information, call (888) 899–2066 or visit www.cleardata.com. WASHINGTON, DC—(Marketwired – Dec 31, 2014) – Pending home sales slightly improved in November and are above year–over–year levels for the third straight month, according to the National Association of Realtors®. All major regions except for the Midwest experienced a slight gain in activity in November. The Pending Home Sales Index,* a forward–looking indicator based on contract signings, increased 0.8 percent to 104.8 in November from a slightly downwardly revised 104.0 in October and is now 4.1 percent above November 2013 (100.7) — the highest year–over–year gain since August 2013 (5.6 percent). Yun also notes that falling gas prices will likely boost consumer confidence and allow prospective buyers the opportunity to save additional money for a downpayment. NAR's 2014 Profile of Home Buyers and Sellers (released in November) found that the median downpayment ranged from 6 percent for first–time buyers to 13 percent for repeat buyers. “There's still misperception out there that a much higher downpayment is needed, while that's not the reality,” adds Yun. The PHSI in the Northeast rose 1.4 percent to 89.1 in November, and is now 7.0 percent above a year ago. In the Midwest the index decreased 0.4 percent to 100.0 in November, and is now 0.5 percent below November 2013. Pending home sales in the South rose 1.3 percent to an index of 119.7 in November, and are 5.1 percent above last November. The index in the West increased 0.4 percent in November to 98.5, and is now 4.9 percent above a year ago. Total existing–homes sales this year are expected to be around 4.94 million, a decline of 3.0 percent from last year (5.09 million), but are then forecasted to rise to 5.30 million in 2015. The national median existing–home price for all of this year will be close to $208,000, up 5.6 percent from 2013, and is likely to moderate to a pace between 4 and 5 percent next year. Existing–home prices rose 11.4 percent in 2013. The National Association of Realtors®, “The Voice for Real Estate,” is America's largest trade association, representing 1 million members involved in all aspects of the residential and commercial real estate industries. The index is based on a large national sample, typically representing about 20 percent of transactions for existing–home sales. In developing the model for the index, it was demonstrated that the level of monthly sales–contract activity parallels the level of closed existing–home sales in the following two months. An index of 100 is equal to the average level of contract activity during 2001, which was the first year to be examined. By coincidence, the volume of existing–home sales in 2001 fell within the range of 5.0 to 5.5 million, which is considered normal for the current U.S. population. NOTE: Existing–home sales for December will be reported January 23, and the next Pending Home Sales Index will be January 29; release times are 10:00 a.m. EST. Information about NAR is available at www.realtor.org. This and other news releases are posted in the “News, Blogs and Videos” tab on the website. Statistical data in this release, as well as other tables and surveys, are posted in the “Research and Statistics” tab.